Nowadays, a great deal of your organization depends on IT. You don’t want a technical issue, human error or cybercrime to endanger the operations of your company. Business Continuity helps with preventative measures (prevent downtime) as well as reactive measures (enable starting up again without loss of data). A good business continuity plan takes all critical factors into account. And provides a solution that is suitable for the specific needs of your organization. Disaster Recovery makes sure your data aren’t lost and are available quickly after a problem, disaster, cybercrime or human error. Cloud back-ups do what you expect them to do, and are easy-to-use, safe and affordable. Nucleus is ISO-certified for data security. We’d love to take a closer look to your security. Cloud replication stores an exact copy of your virtual servers in the cloud. Do you manage critical applications that need an uptime of 99,99%? Then they’re best deduplicated to several locations. Availability depends on several aspects. How critical are your website and application? Which Recovery Point Objective (RPO) and Recovery Time Objective (RTO) do you expect? And which budget do you want to invest? 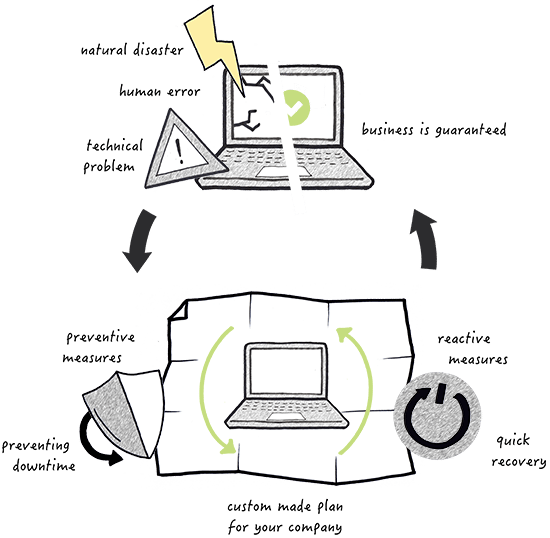 What does business continuity mean for you? An infrastructure that is always up-to-date and performs optimally.